If you saw my earlier post, you know what I've got on my front door this year. A couple seasons ago I designed this fall wreath for the front door at our old house: The home was a quaint brick two-story and I always loved that old rusty door knocker that came with it. 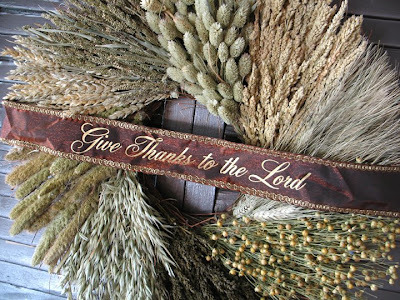 Anyhoo, this particular wreath is also one of the projects in my Inspirational Home book. I fastened a satin ribbon into a bow and gently intertwined it into the wreath. Then I marked the areas of the ribbon tails where I would position my words. I took the ribbon off and penciled in "give" and "thanks." Using burgundy acrylic craft paint, I carefully free-hand painted the letters in a script font. After they were completely dry, I put the ribbon back on the wreath. And the best part is, it came with a ribbon that already has a lovely message on it! "Give Thanks to the Lord." The dried grains make a beautiful arrangement and I love that natural look! It's a new product of DaySpring and can be purchased online here. 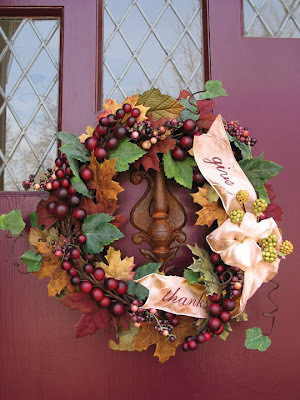 HAPPY FALL - I love the wreaths :) and I just saw your Christmas prints... very fun! So bummed I'm going to miss you in AR next week, but I know it will be great. I linked to a couple of your posts this morning. Hi Jeanne, love what you have done, the wreaths are beautiful. I just found your blog and I love it. Have a blessed day. I've enjoyed looking at some of your past posts. You are very creative! Wow! Both wreaths are gorgeous! those shutters are so much like mine. Love the wreath! 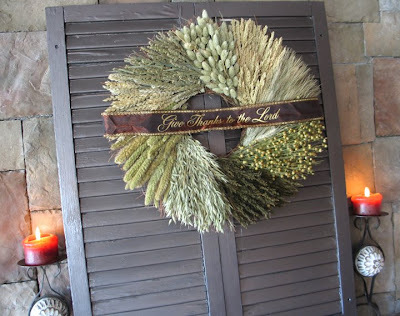 I love the wreath against the shutters... the colors really compliment each other beautifully! Thanks for stopping by my blog and for your sweet comment! Fantastic wreaths, like the way you have displayed them.